1.6.1940 as a satellite of RNAS Donibristle 'on books of MERLIN'. Satellite to R.N. Air Station, Donibristle, later became satellite to R.N. Air Station, Machrihanish. 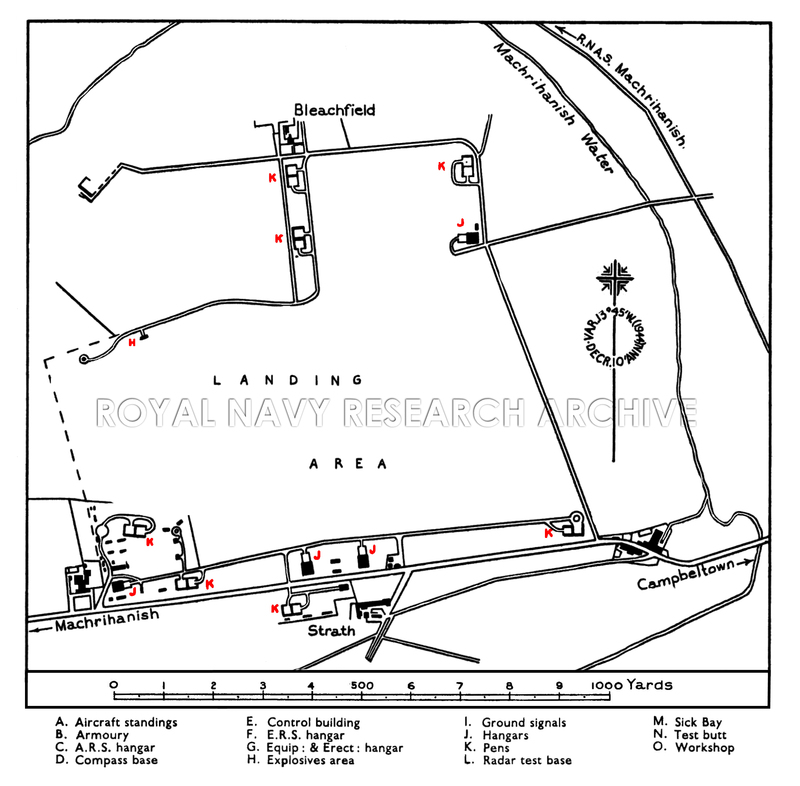 The airfield is situated in Kintyre, 8½i miles N.N.E. of the Mull of Kintyre and 2 miles W. of Campbeltown. R.N.A.S. 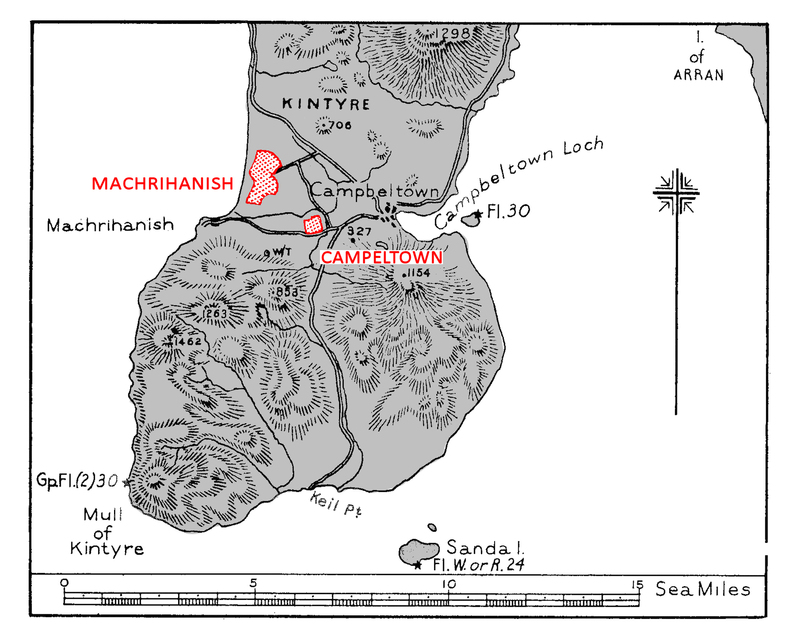 Machrihanish lies If miles N.W. Campbeltown Loch with the town of the same name at its head. Machrihanish Water passes within 200 yds. of the S.E., E. and N. boundaries. Main road from the airfield to Campbeltown and to R.N.A.S. Machrihanish. At Campbeltown there is a small harbour and pier with a depth of-12 ft. alongside. Watch Office on the S.W. side of the landing area. Ground signals Not normally displayed. Irregular. N.N.W./S.S.E., 770 yds. E.N.E./W.S.W., 850 yds. 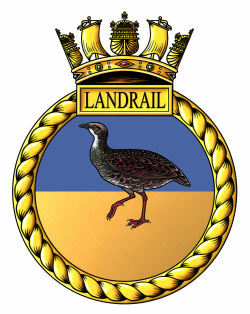 Grass surface ; the field is liable to bog seriously in wet weather on a line drawn E./W. through the centre. Mountainous country to N. and S. with summit (1,462 ft.) 4½ miles S.W. W/T. masts, 90 ft. high, on rising ground at the transmitting station 1¼ miles W.S.W. of the Watch Office. Windsock can be displayed near the Watch Office. Two Nissen huts S. of the Machrihanish-Campbeltown Road. 7 Double pens dispersed around the landing area. Dispersed around the landing area. 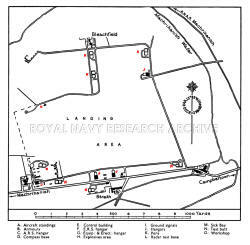 Facilities by arrangement with R.N.A.S. Machrihanish. 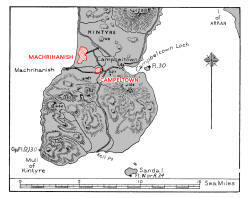 Meteorological information is obtained from Machrihanish. No storage. Supply by bowsers from R.N.A.S. Machrihanish. Explosives area along the N.W. boundary.